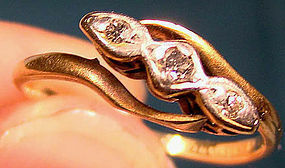 An Edwardian 18k yellow gold and platinum diamonds ring 1900-10. This size 5-1/2 ring features three dimonds in platinum mounts; it measures 1/2" across the diamonds and it weighs 1.7 grams. It is stamped FINE PLAT 18 Ct., and it is in excellent original condition with no chips, cracks, dents, bends, corrosion, losses, damage or repairs. All items are thoroughly and conservatively graded and all condition issues are noted; all items are vintage or antique and may have slight signs of gentle use. Expedited tracked and insured parcel shipping to the U.S. starts at $20 (other spots may vary, air is higher). Items paid with a credit card will be shipped to confirmed addresses only. We do ship internationally. All of our prices are in $US. PLEASE NOTE: We DO NOT accept PayPal. 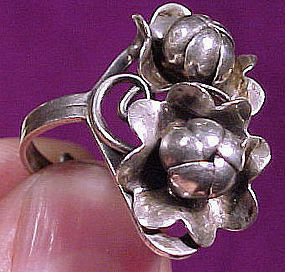 A (currently) size 6 adjustable Arts & Crafts sterling silver ring c1920. This ring features finely detailed flowers and tendrils, and it measures 1 x 11/16". It is stamped STERLING, it weighs 4.0 grams, and it is in excellent original condition with no dents, bends, corrosion, losses, damage or repairs. All items are thoroughly and conservatively graded and all condition issues are noted; all items are vintage or antique and may have slight signs of gentle use. Small packet air shipping to the U.S. starts at $9.50 (other spots may vary) - insured is higher, and mandatory on items over $95 if paid with a credit card. Items paid with a credit card will be shipped to confirmed addresses only. We do ship internationally. All of our prices are in $US. NOTE: we DO NOT accept PayPal. 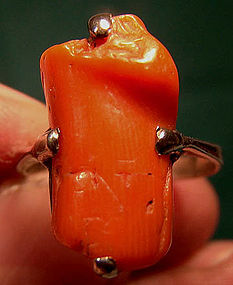 An Arts and Crafts style size 6-1/4 sterling silver ring with a natural shape claw-set coral section circa 1900-10. This vintage size 6-1/4 or 6.25 ring measures 3/4" x 3/8" across the coral. It weighs 3.5 grams, and it is unmarked but tested. This item is in excellent original condition with no chips, cracks, dents, bends, corrosion, losses, damage or repairs. All condition issues are noted. All items are vintage or antique and may have signs of use and patina as would be expected. Tracked insured air post to the US starts at $14 (other spots may vary). Items paid with a credit card will be shipped to confirmed addresses only. We do ship internationally. All of our prices are in $US. PLEASE NOTE: we DO NOT accept PayPal. 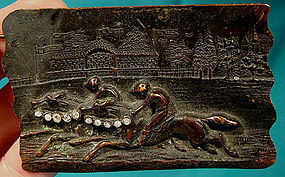 A finely detailed late Victorian or Edwardian period sash pin in patinated copper, depicting a high relief horse race with a spectator pavilion and park in the background c1900-10. This 3" x 1-7/8" brooch has a trombone catch, old cut rhinestones along the horses' reigns, and a wave edge. This item is in excellent vintage condition with no chips, cracks, dents, bends, corrosion, losses or damage, but please note that one of the rhinestones may have been re-glued/replaced. All items are thoroughly and conservatively graded and all condition issues are noted; all items are vintage or antique and may have slight signs of gentle use. Small packet air shipping to the U.S. starts at $9.80 (other spots may vary, other options available). Items paid with a credit card will be shipped to confirmed addresses only. We do ship internationally. All of our prices are in $US. PLEASE NOTE: We DO NOT accept Paypal, only VISA and MASTERCARD. A vintage Edwardian gold plated 2-3/4" tie clasp with a central reverse painted shamrock c1900-10. The shamrock measures 5/8 x 1/2" and this pin slips over the tie, anchoring it to the shirt. It is in excellent original condition with no chips, cracks, dents, bends, corrosion, losses, damage or repairs. All items are thoroughly and conservatively graded and all condition issues are noted; all items are vintage or antique and may have slight signs of gentle use. Surface shipping to the U.S. starts at $6.80 (other spots may vary) - insurance is included in shippng. Items paid with a credit card will be shipped to confirmed addresses only. We do ship internationally. All of our prices are in $US. PLEASE NOTE: We DO NOT accept PayPal, only VISA and Mastercard. 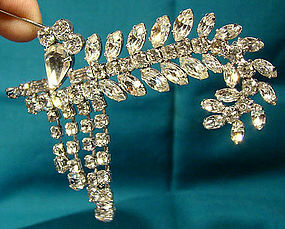 A cool retro 3 x 2" sterling silver and claw-set rhinestone pin with dangling strands c1950s. This signed JayFlex pin features flashy round, marquise, teardrop and baguette stones, and it has a safety catch. It resembles a curled frond, it is signed JAY FLEX STERLING, and it is in excellent original condition with no chips, cracks, dents, bends, corrosion, losses, damage or repairs. All items are thoroughly and conservatively graded and all condition issues are noted; all items are vintage or antique and may have slight signs of gentle use. Surface shipping to the U.S. starts at $6.30 (other spots may vary) - insured is higher, and mandatory on items over $95 if paid with a credit card. Items paid with a credit card will be shipped to confirmed addresses only. We do ship internationally. All of our prices are in $US. NOTE: we DO NOT accept PayPal. A perfect item guaranteed to annoy your butler - this is a 5-3/8" tall sterling silver handled dinner bell with a silver plated bell c1900. It is stamped STERLING on the handle, and it is in excellent original condition with no dents, bends, corrosion, losses, damage or repairs. All items are thoroughly and conservatively graded and all condition issues are noted; all items are vintage or antique and may have slight signs of gentle use. Surface shipping to the U.S. starts at $6.30 (other spots may vary) - insured is higher, and mandatory on items over $95 if paid with a credit card. Items paid with a credit card will be shipped to confirmed addresses only. We do ship internationally. All of our prices are in $US. PLEASE NOTE: we DO NOT accept PayPal. A mid-Victorian 1-1/2 x 1/2" barbell-style bar pin with enamel and seed pearls c1860-70. This pin has fancy ornate hand-tooled gold work with cobalt blue enamel stars and seed pearls. It is in 15k yellow gold (unmarked but tested), it has an E. Woodrow inscription on the mount, and it has a c-clasp closure. It weighs 6.1 grams, and it is in excellent original condition with no chips, cracks, dents, bends, corrosion, losses, damage or repairs. All items are thoroughly and conservatively graded and all condition issues are noted; all items are vintage or antique and may have slight signs of gentle use. Surface shipping to the U.S. starts at $6.30 (other spots may vary) - insured is higher, and mandatory on items over $95 if paid with a credit card. Items paid with a credit card will be shipped to confirmed addresses only. We do ship internationally. All of our prices are in $US. NOTE: we DO NOT accept PayPal. 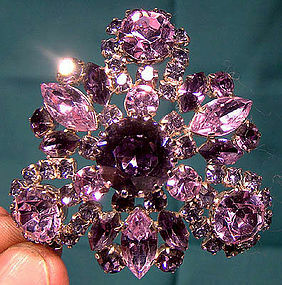 A flashy, high quality signed MADE IN AUSTRIA 2-1/4" across rhinestone pin c1950s-60s. The claw-set stones are in purple and pale purple/blue in varying sized and cuts and all reflect the light brilliantly; it has a safety catch and it is in excellent original condition with no chips, cracks, dents, bends, corrosion, losses, damage or repairs. All items are thoroughly and conservatively graded and all condition issues are noted; all items are vintage or antique and may have slight signs of gentle use. Surface shipping to the U.S. starts at $6.30 (other spots may vary) - insured is higher, and mandatory on items over $95 if paid with a credit card. Items paid with a credit card will be shipped to confirmed addresses only. We do ship internationally. All of our prices are in $US. NOTE: we DO NOT accept PayPal. A 1-1/8 x 9/16" crusifix pendant in 10k yellow gold. This pendant is marked 10K on the loop, it weighs 0.8 grams, and it is in excellent original condition with no dents, bends, corrosion, losses, damage or repairs. All items are thoroughly and conservatively graded and all condition issues are noted; all items are vintage or antique and may have slight signs of gentle use. Surface shipping to the U.S. starts at $6.30 (other spots may vary) - insured is higher, and mandatory on items over $95 if paid with a credit card. Items paid with a credit card will be shipped to confirmed addresses only. We do ship internationally. All of our prices are in $US. NOTE: we DO NOT accept PayPal. 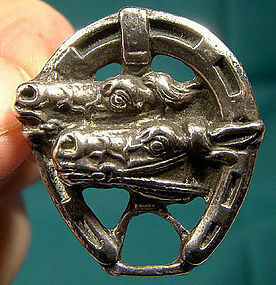 A sterling silver horse race horseshoe brooch circa 1900 1910. This antique nicely detailed silver equestrian motif pin in the shape of a horse shoe enclosing two neck-and-neck three dimensional horse heads in a race. It measures 1-1/8" x 1" and is stamped STERLING. It weighs 8.5 grams and has a safety catch. Great gift idea for a fan of horses or horse racing. It is in excellent vintage condition with no dents, bends, corrosion, losses, damage or repairs. All condition issues are noted. All items are vintage or antique and will usually have signs of use or patina. Tracked insured post to the US starts at starts at $18.50 (other spots may vary). Items paid with a credit card will be sent to confirmed addresses only. All of our prices are in $US. PLEASE NOTE: We DO NOT accept PayPal. A vintage Edwardian strand of facetted, graduated amber beads with gold plated wire stringing c1910. This necklace has a hook clasp, the beads measure from 5/8 to 3/8" across, and four of the beads are a darker cola colour than the rest. This item is in excellent original condition with no chips, cracks, corrosion, losses, damage or repairs other than a bit of roughness on two tips on the largest dark bead (barely noticeable). All items are thoroughly and conservatively graded and all condition issues are noted; all items are vintage or antique and may have slight signs of gentle use. Expedited tracked insured parcel shipping to the U.S. starts at $22 (other spots may vary, air is higher). Items paid with a credit card will be shipped to confirmed addresses only. We do ship internationally. All of our prices are in $US. PLEASE NOTE: we DO NOT accept PayPal, only VISA and MASTERCARD. 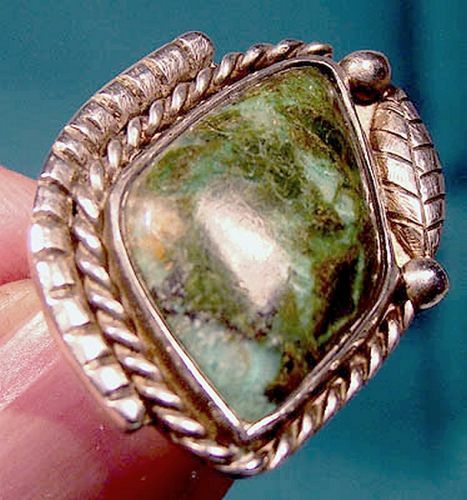 A Navajo green turquoise sterling silver ring circa 1970s. This vintage size 4 ring has with a natural green turquoise stone. The ring measures 1-1/4" x 1", the stone has deep forest green, light green and a touch of blue green areas. The silver is worked with rope twists and a tooled leaf. This elegant ring is stamped 925which apparently was done by the jeweller after sizing it. It weighs 10.2 grams, and it is in excellent original condition with no chips, cracks, dents, bends, corrosion, losses, damage or repairs. All items are thoroughly and conservatively graded and all condition issues are noted; all items are vintage or antique and may have slight signs of gentle use. Tracked packet air insured post to anywhere in the US is $14 (other spots may vary). Items paid with a credit card will be shipped to confirmed addresses only. We do ship internationally. All of our prices are in $US. PLEASE NOTE: We DO NOT accept PayPal. 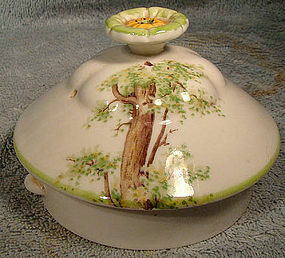 A Royal Albert Greenwood Tree tea pot lid. This vintage hard to find 2-3/8" tall flower finial teapot lid in this discontinued English bone china pattern measures 3" across the interior extension which sits in the top of the teapot. Thiss rim is 7/8" deep and the lid measures 3-5/8" across the rim. It is the green trimmed version. This item is in excellent original condition with no chips, cracks, crazing, losses, damage or repairs. The un-glazed lid bottom shows some tea staining, which we would imagine can be removed with vinegar. The mark is shown for reference only as this item is unmarked. All condition issues are noted. All items are vintage or antique and may have signs of use and patination as would be expected. Tracked packet air post to anywhere in the U.S. is $14. Rates vary by destination, value, size, weight, payment option, country and method. Other payment, tracking and insurance options are available - please inquire. Please contact us for an accurate quote with your postal code or country. Items paid with a credit card will be shipped to confirmed addresses only. We do ship internationally. All of our prices are in $US. PLEASE NOTE: We DO NOT accept PayPal. A pair of Victorian vaseline opalescent glass epergne bowls. This fine pair of blown molded bowls date to the 1880s. These 5" diameter bowls stand 2-3/4" high and their bases are 3" across (under the collar of pressed leaves). They are unmarked and they have polished bases; they are in excellent original condition with no chips, cracks, losses, damage or repairs other than a barely visible 1/16" shallow flake to a rib on the base of one bowl. All items are thoroughly and conservatively graded and all condition issues are noted; all items are vintage or antique and may have slight signs of gentle use. Tracked Packet shipping to anywhere in the U.S. is $17.00 - this includes online tracking, air service and insurance up to $75. Items paid with a credit card will be shipped to confirmed addresses only. We do ship internationally. All of our prices are in $US. PLEASE NOTE: We DO NOT accept PayPal. A Wallace engraved cocktail shaker circa 1915 1920. This ornate vintage silver plate barware item is 13-1/4" tall. This pitcher features a large lid with a cork stopper, a cork-lined spout cap and a fancy engraved pattern which may correspond to one of Wallace's flatware patterns (a go-with piece). 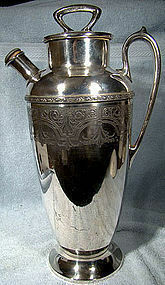 It is stamped 64 OZ V8099 WALLACE BROS. SILVER CO. This elegant bar ware item is in very good condition with no dents, bends, corrosion, losses, damage or repairs other than some minor wear to the silver plating over areas of the engraved pattern on each side. We have not polished the interior of the shaker. All items are thoroughly and conservatively graded and all condition issues are noted; all items are vintage or antique and may have slight signs of gentle use. Expedited tracked insured parcel shipping to the U.S. starts at $27 (other spots may vary, air is higher). Items paid with a credit card will be shipped to confirmed addresses only. We do ship internationally. All of our prices are in $US. PLEASE NOTE: We DO NOT accept PayPal, only VISA and MASTERCARD. © Fiona Kenny and www.fionakennyantiques.com. Unauthorized use and/or duplication of any part of this material without express and written permission from this site’s author and/or shop owner is strictly prohibited. A vintage First Australian Imperial Force (AIF) privately purchased World War I era pin in 9K yellow gold. This 1-5/8" long x 3/4" tall pin appears to have been privately commissioned, as it is 9K gold and it is a copy of the 1904 Type 2 Rising Sun medal, and was most likely produced as a wife/sweetheart pin. It has the early crown and rays, it is fully hand engraved including the legend AUSTRALIAN COMMONWEALTH MILITARY FORCES, and it is stamped 9CT on the back of the pin and on the clasp/closure. It is rose gold with a deep yellow gold wash - you can see traces of the rose gold beneath. It has a old safety-pin style catch, and it is in overall excellent vintage condition with no breaks, corrosion, losses, damage or repairs, but please note there are a couple of minute dents on the bar pin section. All items are thoroughly and conservatively graded and all condition issues are noted; all items are vintage or antique and may have slight signs of gentle use. Expedited tracked insured shipping to the U.S. starts at $21 (other spots may vary, xpresspost is higher) - tracking and insurance are included in shipping quotes. Items paid with a credit card will be shipped to confirmed addresses only. We do ship internationally. All of our prices are in $US. PLEASE NOTE: WE DO NOT accept PayPal, only VISA and MASTERCARD. A 12-3/8" tall (including stopper) simple and undecorated vintage c1900 blown glass decanter with its original blown stopper by Dorflinger Glass Co. (1862-1921). This decanter measures 6" across the body, and this decanter retains its original (slightly worn) Dorflinger small sticker or label on the bottom. This item is in excellent original condition with no chips, cracks, losses, damage or repairs; it has the expected minor straw marks and imperfections found on early hand-blown glass pieces. There is a slight bit of calcium on the bottom which we haven't removed. All items are thoroughly and conservatively graded and all condition issues are noted; all items are vintage or antique and may have slight signs of gentle use. Surface shipping to the continental U.S. starts at $18 (other spots may vary) - insured is higher, and mandatory on items over $85 if paid with a credit card. Items paid with a credit card will be shipped to confirmed addresses only. We do ship internationally. All of our prices are in $US. NOTE: we DO NOT accept PayPal.